Want To Build Your Professional Network? Get Your Spot Reserved Now For Our November Networking Event. $150.00 per person, 16 people per Limousine / $2,200.00 for a private Limousine for your company. Your Fee includes: The Limousine Ride to and from, your lunch, guest speaker, and Network book. 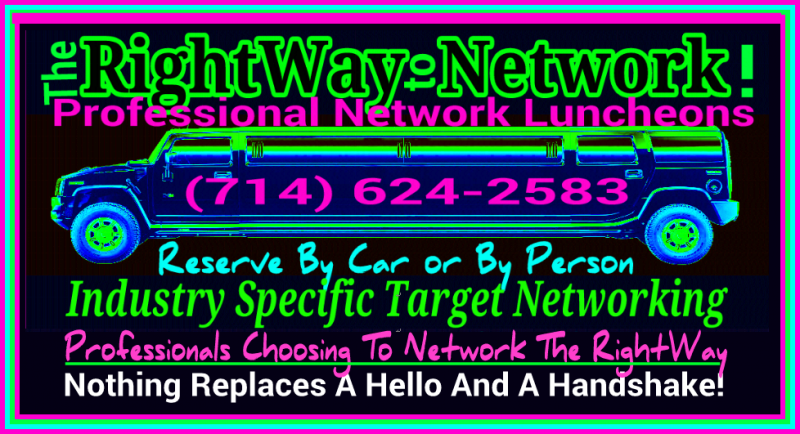 A one-time discount of $25.00 off your first RightWay Network Lunch price for all new members. 1 Hour Limousine Ride to the Luncheon Location. 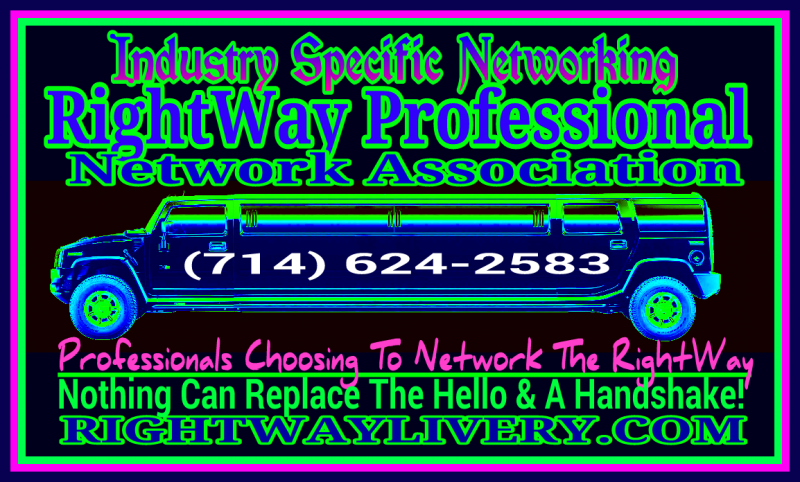 You will be riding with others who have networking interests in the same Industry. Or your office can reserve a Limousine specifically for your personnel. You may bring your own alcoholic drinks to enjoy during your Limousine ride there. You will have 1 hour prior to eating (your lunch is included) to mingle and meet new people in your industry who came to meet professionals you. Bring plenty of business cards and information about you or your business you want to pass out and put on our tables. A RightWay Professional Network Book will be handed out with the attendees Business information to take with you. Everyone who makes a reservation in time will be able to supply this information material. It will include a space for a business card, & photo. To take advantage of this please supply the information prior to the event by the date required. These books will have areas to write notes also. They will be printed and distributed at the RightWay network luncheon for you. There is NO extra charge for this it’s included with your reservation. If you meet someone at the Luncheon and you want to continue to talk with them on your ride back in the Limousine, we can most likely move people around to accommodate this. Our agenda is to get you connected and networking with the correct people to assist you in your success! Reservations made before September 15, 2014 will receive a $ 25.00 discount. Every three months we offer a Luncheon for a Specific Industry. We send out invitations to Our Professional Network Members on our mailing lists. If you’re a Professional looking for more contacts and networking in “Your Industry Related Fields”, our RightWay Sleigh-Ride Network Lunch is perfect for you. If you’re not on our Mailing List yet YOU SHOULD BE. Shoot us an email in the message put “ADD ME TO MAILING LIST” You can find our contact information below. WE look forward to seeing YOU at our event. We Look forward to meeting you. If you should have any questions please contact us. This Page is still under construction for our next event Please check back to get the dates.